Is this better than winning the "Lottery"? Looks like I have an admirer. Received an email a few minutes ago, from someone I don't know. Note that her name is "Brenda" in the email, but "joy" in the From column. She also wants me to contact her via a different email address. Love the line about age, race and religion never being a problem. She's obviously very versatile. I'm not in the market for a new relationship, but if you are, feel free to contact this person. Where do you keep Your kids? Michigan VA Loans, Veterans Can Buy With No Money Down. 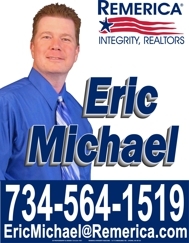 One small step for real estate, one giant leap for Eric!